Fill Out the Form to Receive a Free Three-Day Pass to Try Out Our Gyms and Classes! Try any Columbia Association gym and classes for FREE for 3 days in April! 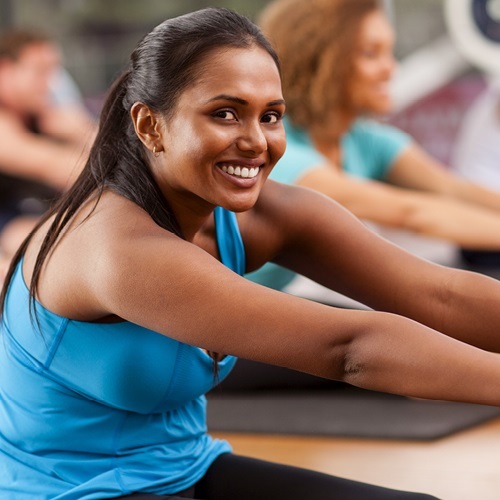 Group fitness classes at Columbia Association offer an exciting and engaging way to get healthy. Get motivated and energized in a group setting. Maintain your best physical and mental self, all while making new friends and exercising at your own pace. Strength Training — Get an intense total body workout in classes such as Les Mills BodyPump, Cardio Barre Tone, and Cardio HIIT Tone, all set to inspiring, energetic music. Studio Cycling — Improve your endurance while mastering hills, flats, and intervals, using music, high-definition video and more. Dance Fitness — Enjoy aerobic dance exercises to a variety of music genres with Cardio Dance Party, LaBlast, Zumba®, and more. Yoga and Mind Body — Improve your flexibility and overall wellness in a variety of mind body offerings such as Flow Yoga and Tai Chi. HIIT (High Intensity Interval Training) — Boost your metabolism with rapid, intense workouts followed by brief, active recovery periods. CA’s enthusiastic, certified instructors can’t wait to meet you! Our updated fitness centers offer more than 1,000 square feet of studio space for group exercise, dedicated cycling studios, and other amenities. Contact or visit us today to ensure your best rate! Month-to-month memberships are also available. To learn more, visit your club of choice, fill out the contact form above, or contact our Customer and Member Service Center at 410-730-1801. DISCLAIMER:*Offer expires 4/26/19 and is valid for new members and first time visitors only. Must activate pass on or before 4/26/19. Pass is valid for three consecutive days once activated at one of CA’s fitness clubs only. Cannot be combined with any other special offer or discount. Classes are available on a space-available basis. Personal training, swim lessons and martial arts classes are additional fees. Some fees and restrictions may apply. Must be at least 18 years old to use pass.